If you’re a commercial property owner, you’ve got a lot of responsibilities to juggle: utilities, personnel, maintenance schedules—not to mention taking care of your landscape. But something else you probably have on your mind frequently is security. While we might not pride ourselves as security experts at Engledow, we are outdoor lighting experts, and we understand just how important lights can be for keeping your business safe.They not only deter trespassers, they also increase visibility for the people who are supposed to be on your property. As an added bonus, outdoor lights can really accentuate your property’s most attractive features, such as brick facades, walls, or beautiful plant life. Get the right lights for the job. In recent years, the technology behind outdoor bulbs and lighting systems has improved immensely. Many property owners were using high-voltage, incandescent bulbs to light their landscapes 10 or 20 years ago, but the current trend is to use LED (light-emitting diode) bulbs, which are far more efficient. Not only do they use approximately 70 to 80 percent less energy as compared with incandescent bulbs, they usually work for about 50,000 hours. That means even if you left your lights on for 24 hours a day, they could very well last for more than five years! Put your lights in the right places—and protect them. The placement of your lights is just as important as using the right equipment. Your lights should clearly illuminate entry points, walkways, stairs, signage, parking lots, and maybe a few key features of your property. Do not put ground lighting in areas with high foot traffic, or in places where plant growth might block light unintentionally. You’ll also want to watch out for putting ground lights in places prone to flooding or excessive snow buildup. 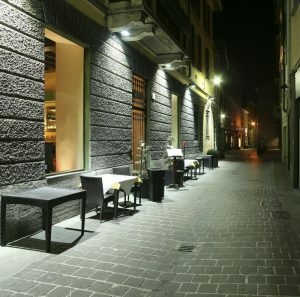 If these types of issues are a concern for you, or you just want to elevate your lighting, you can consider using light posts or connecting them directly to your building. Take advantage of automation. Digital timers and control options are now far more advanced than simply allowing you to flip the lights on at a specified time. These days, they can be programmed to account for changing weather conditions (such as turning on during a daytime rain storm) or sunrise/sunset times, and can even change colors with the push of a button. You can also pick which lights you want to sense motion, which lights should be on a timer, and the ones you want to be activated manually. Don’t overdo it. While lights should cover all of your most important areas, you don’t want to flood your property with too much illumination. Too much light can be distracting for neighbors, is unflattering, and will run up your electric bill. Try to evenly distribute your lights in a way that avoids excessive overlapping, and consider using motion sensors to limit the number of lights that stay on all night. Work with the pros. When setting up your outdoor security lighting, nothing beats working with objective experts. They’ll be able to quickly point out areas of greatest concern, position your lights in aesthetically pleasing ways, and help you choose bulb and equipment options that are effective and reliable. When an experienced professional handles the job, you can also be confident your lights will be safely installed, and that they’ll work when you need them. Our team of outdoor lighting professionals at Engledow has been helping local businesses set up security lighting for decades. And we also know a thing or two about setting up outdoor lighting at your home. If you’re interested in learning more about how we can help protect your property with outdoor lights, we’re ready to talk. Contact us today to learn more. This entry was posted in At Work, Exterior and tagged Featured by Eric Engledow. Bookmark this link.